I had two cucumbers, and since the kids won’t eat any more tzatziki, I wanted to try sandwich pickles. I think of sandwich pickles as a flat board that covers my whole sandwich and I particularly like them on Cuban sandwiches – another epic meal that takes several days to assemble. I also wanted to make pickles that the kids might actually eat, since they like sandwiches a lot. Bread and butter pickles are sweeter, which should appeal to their sweet toothes, (sweet teeth?) I’m not sure which is most correct, but those kids like their sugary foods! Several of my cookbooks have recipes for bread and butter pickles, but since I didn’t have all the correct ingredients for any of them – we headed off into recipe bastardization land. 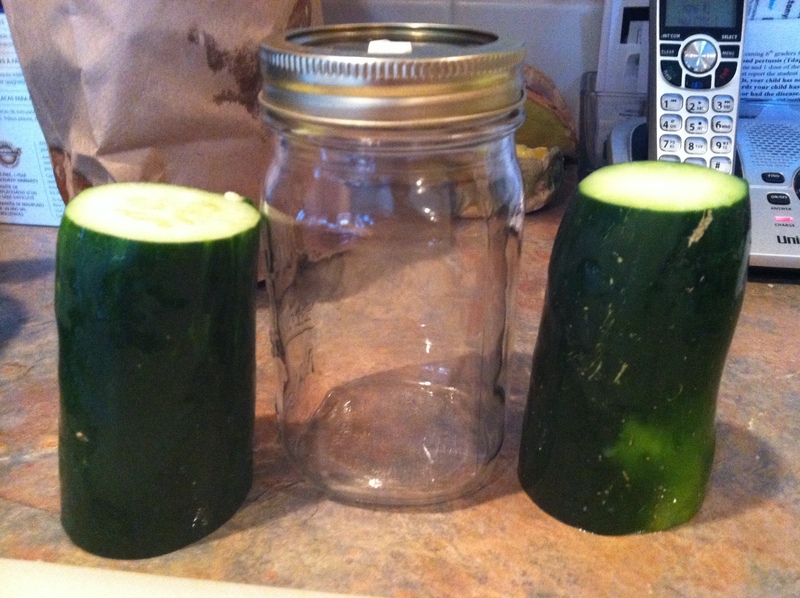 I cut the cucumbers across once, so the pickles would fit in my pint jars. Then I peeled and sliced them lengthwise. I started slices at about 1/8″ thick, but that was too thin and by the end I decided just under 1/4″ thick is best. 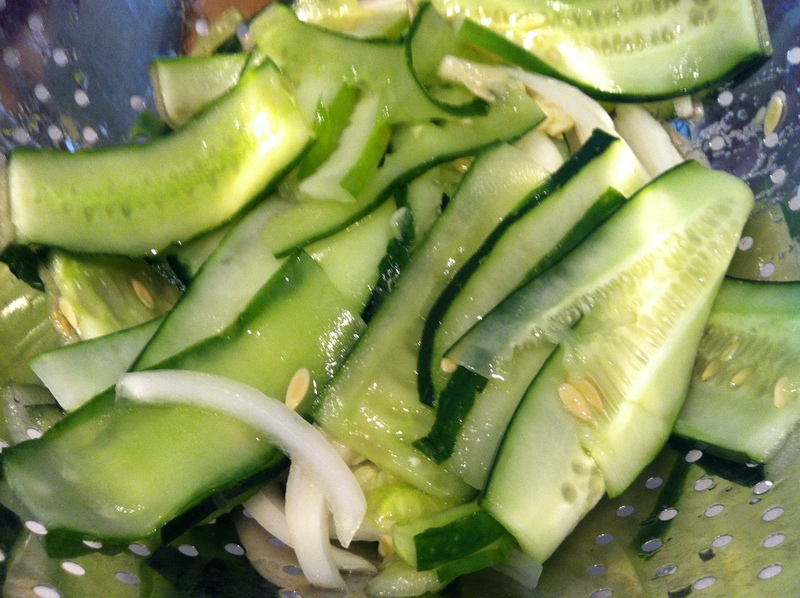 Combine the onions and salt with the cucumber, then cover with ice and let sit at room temperature for several hours. The kids could not figure out what was going on here. Truth be told, I didn’t understand this step either, but I was trying to follow the instructions, sort of. I returned this to a boil after the cucumber mix was added, then placed the pickled vegetables in my sanitized jars with a slotted spoon, leaving about 1/2″ of head room at the top. After I put the caps on, I boiled again for another 10 minutes and then slowly and carefully removed the jars from the pot of boiling water with tongs. My daughter said it looked like a science experiment, which I guess it was. Now I just need to start working on the ham, and the pork roast, and the paninni for some Cuban sandwiches. 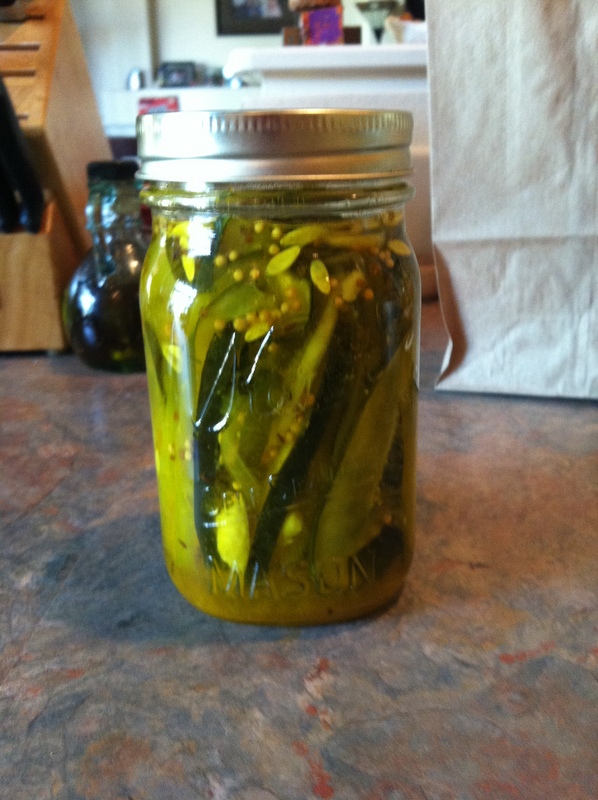 This entry was posted in Recipes and tagged bread and butter pickles, canning, cucumber, pickles. Bookmark the permalink. 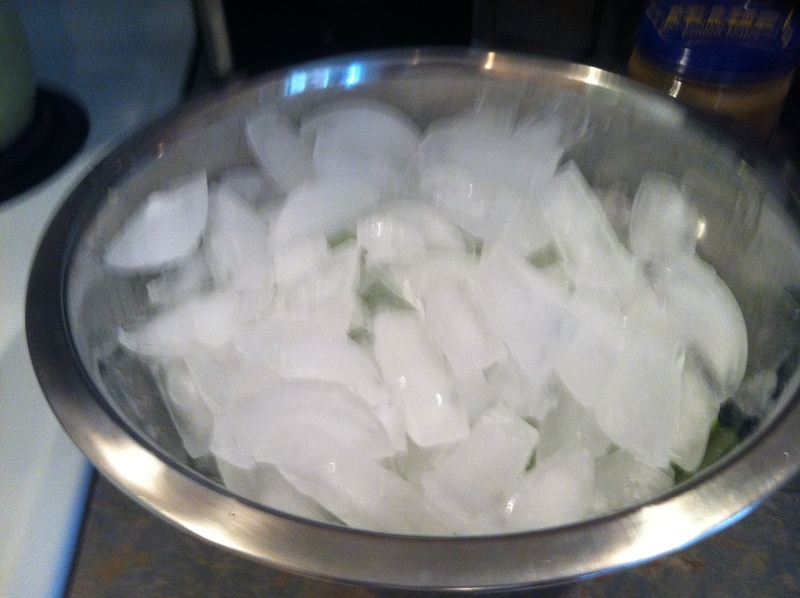 Interesting about having to “ice” the cukes and onions. 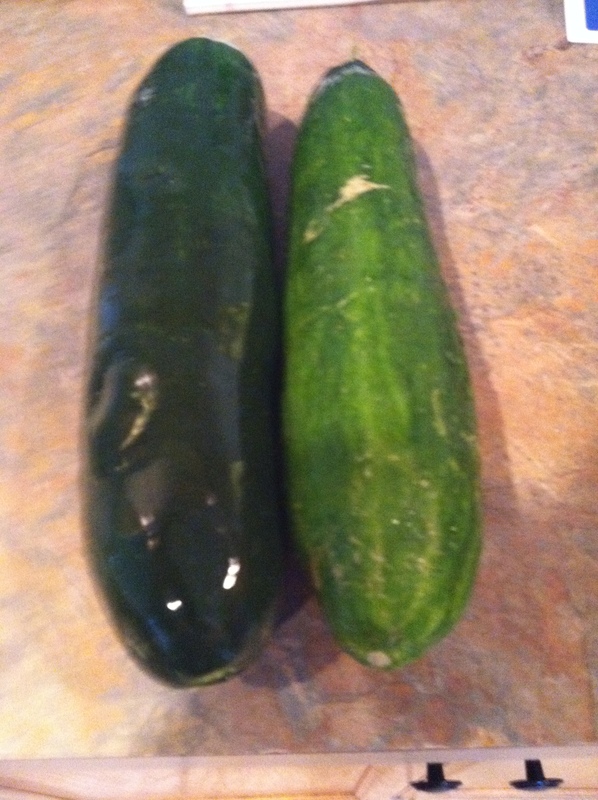 Also, I like that you only had two cucumbers to work with but you decided to go to the trouble of canning them. I wouldn’t think to do that … I am sort of programmed to think that I have to have a big bunch of anything to go to the trouble. Again, you’ve made this process sound so easy and well worth the effort! Thanks for posting it up!!! Love it! I was reading the great blog Food In Jars and she convinced me that it was worth it to try canning small batches of stuff. 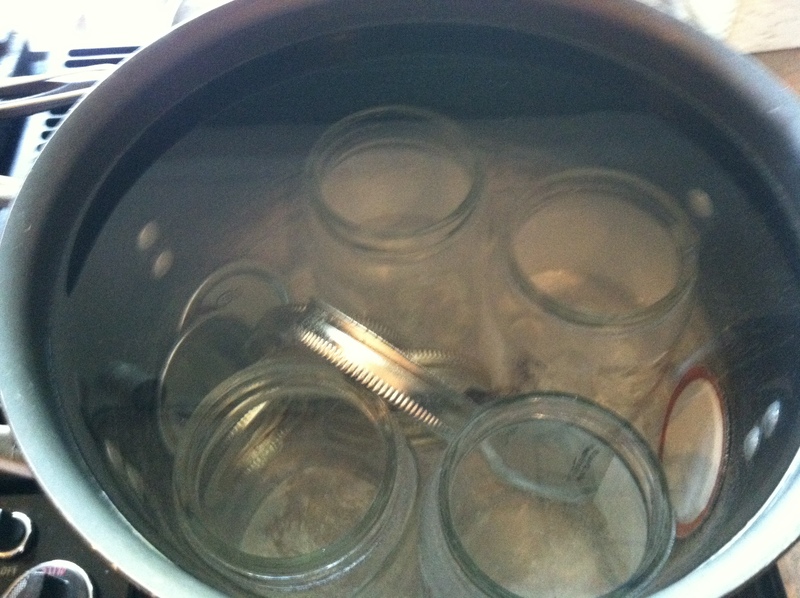 And try pickling. So this has been a summer of pickling for me. But we like our kosher dills, and like ’em crunchy, so I’ve had pickle jars going in the fridge for a couple months now. When they are all used up I’ll crack open the dilly beans and pickled/canned zucchini slices that are waiting in the pantry.